In 2017, we had 41 member gardeners grow produce, herbs, and flowers in their individual plots. We grew approximately 880 pounds of sweet potatoes total crop. Last year, we grew approximately 1300 pounds—we were 400 pounds less this year due to late planting date of Thurs. June 22, as well as growing a different variety (Orleans vs. Beauregard in past years—this year we were unable to obtain the Beauregard slips). Our largest potato this year was 4.25 pounds, compared to the 11 and 12 pounders we have grown of the Beauregard variety. Workshops and Events: part of our mission is to provide educational workshops, as well as community-building events. 1. Added two additional signs to the Neighbor Garden with less words to make it more clear what the Neighbor Garden is and who it is for. 2. Neighbor Garden was more understood & used by neighbors who picked from it. 3. Scott and Eric put a fan into the shed to keep the shed cooler during the summer months. DCG Board Members assisted with the annual Seed Share (scheduled for the last Sat. in January) hosted by the Douglas County Health Dept./ Community Garden Network. Mary presented about the DCG as part of the Neighborhoods USA (NUSA) conference on a panel about Greening Midtown. ABANDONED CISTERN: On Oct. 21, 2017 a hole in the ground was observed. After some digging it is apparently an abandoned cistern, with brick-lined walls. Measures at least four feet deep, width is unknown but gets wider as it goes down. Douglas County Health Dept. has been consulted, and we are researching the best way to fill it. It takes a village to make a community garden a success. Thank you to everyone who helped with our garden this season and helped us reach our goals. 2014 was a year of major accomplishments for Dundee Community Garden. In the spring we installed solar panels on our tool shed (making our lawn-mowing and weed-whacking fossil-fuel free), planted a strawberry patch as an edible groundcover under our six fruit trees, planted a native prairie wildflower area for pollinators (where native plants can send down 20 foot tap-roots, making them drought-tolerant), and built a retaining wall along the alley side of the garden. On a wet and muddy Saturday in June, we planted our 250 sweet potato starts, which yielded over 1000 pounds of sweet potatoes when we dug them up in October. We donated approximately 950 pounds of fresh organic produce to the Underwood Tower this year, which is more than we have ever donated in a single year. Since our founding in 2009, we have donated 3,937 pounds of fresh produce to others. 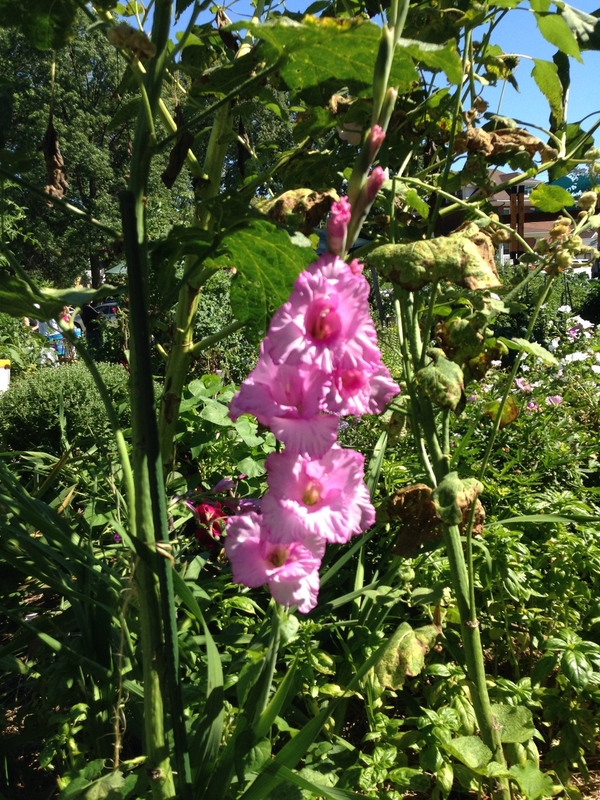 We hosted a number of events in 2014, including our annual Ice Cream Social in June, a Watermelon Feed in July, and educational workshops including What to Plant and When, Herbs from the Garden, and Edible Weeds. In August, we were delighted when scouts from Boy Scout Troop 42 built new compost bins for us as part of Jack McCullough’s Eagle Scout Project. Jack designed the bins with removable wooden slats, making it easy to turn the compost from bin to bin. The corner posts are set in concrete, and the wooden slats are made of cedar—it is a highly functional design! Also in August, our new entranceway, designed by sculptor Dan Newberry and Greensleeves Landscaping, was completed. 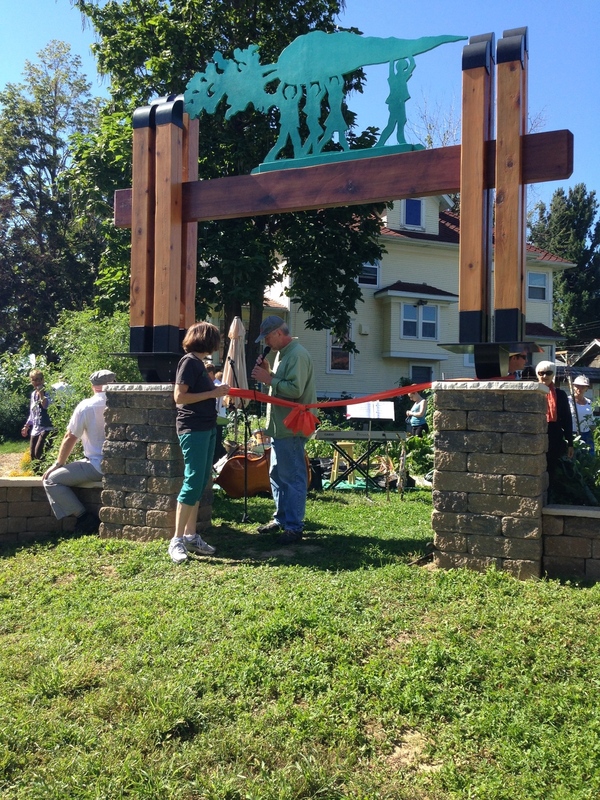 With its whimsical depiction of people carrying a giant carrot, it serves as a welcoming entrance to both the community garden and the Dundee neighborhood. DCG hosted a 5th year birthday party on Sunday Sept. 7, with a ribbon cutting at the new entranceway, and remarks from City Council President Pete Festersen and DMPA President Adam Langdon. With live music from the “Burt Street Individuals” and homemade carrot cake using carrots from the garden, it was a gala event with over 150 people attending. In October, a bronze plaque recognizing those who donated $150+ to our Growing Roots fundraising campaign in 2013 was installed in our 49th Street flowerbeds. While the DCG is a relatively small garden, our compact design provides growing space for 41 members, as well as additional plots for growing produce to donate, and a “Neighbor Garden” area where anyone walking by the garden is invited to help themselves to fresh produce. DCG is a 501(c)3 organization, and donations are fully tax deductible. Plans for 2015 include setting up drip hoses for irrigation for the sweet potato area, as well as improving the Neighbor Garden area, compost signage, and purchasing needed garden equipment. Every year we have expenses that exceed our membership fee. If you would like to make an end-of-year tax-deductible donation to the DCG, you can donate through our website at DundeeGarden.org, or send a check to our Treasurer Ben Tiggelaar, at 14302 FNB Pkwy, Omaha, NE 68154. Thank you for considering DCG in your charitable contributions. Happy Winter and we’ll be back next Spring!